A percolator stove top coffee pot is a common thing in Italy, because Italians appreciate strong and flavored coffee. Therefore, they are also known as mocha pots. You can buy a percolator of any color and capacity at your local supermarket. These devices look like simple pots. There are stovetop and electric percolators. They work on the same principle. This kind of electric coffee maker has a number of advantages. First, most electric ones switch off automatically once the brewing is over. Second, some models can please you with a cup of cappuccino or latte. How does an italian coffee maker work? A percolator uses the effect of steam pressure. It is called so because the brewing process is similar to a geyser eruption. This device features two chambers. The bottom one is filled with water, and the upper one – with just-made hot drink. They are separated by a vortex-shaped filter, which contains ground beans. There is a tube in the middle, which has an additional filter with a gasket on its lower end. It operates on a very simple principle. As the lower chamber heats up, the liquid begins to turn into steam and force hot water up. It saturates the coffee grounds and takes on the flavor. The newly brewed coffee rises up the tube. Once there is no liquid left in the lower chamber, the drink is ready. A stove top espresso maker must be rinsed after each use. Many stovetop mocha pot are ok with a dish washer. Capacity: make sure that one use provides coffee for your entire family. Materials: the body can be made of plastic, grilamid, aluminum, and stainless steel. Grilamid and stainless steel are more preferred, although they are more expensive. The inner coating may consist of ceramics. The lid: make sure it closes and opens easily, and it is imperative that you buy a mocha pot with a heatproof lid. Water level control: this is a priceless option for a percolator. Use coarse or medium ground beans. Use fresh water (from natural springs or filtered). Cover the top and the bottom chamber tightly. It is advisable to grind beans right before brewing. Do not remove the cover until the brewing is over. If you do, you may get burnt badly. Rinse it after each use. Prior to rinsing, cool it down. Do not use rigid scrubs or abrasive cleansers. Some models can be washed in a dish washer. Check the filters and gaskets, because they are the most vulnerable parts of percolator. Clean the filter from coffee grounds thoroughly. To remove buildup, use an appropriate cleaning agent or baking powder. Do not remove buildup from the walls of the chamber. The buildup consists of coffee oils, which prevent drinks from getting a taste of aluminum. If your mocha pot is made of another alloy, you won’t have this problem. 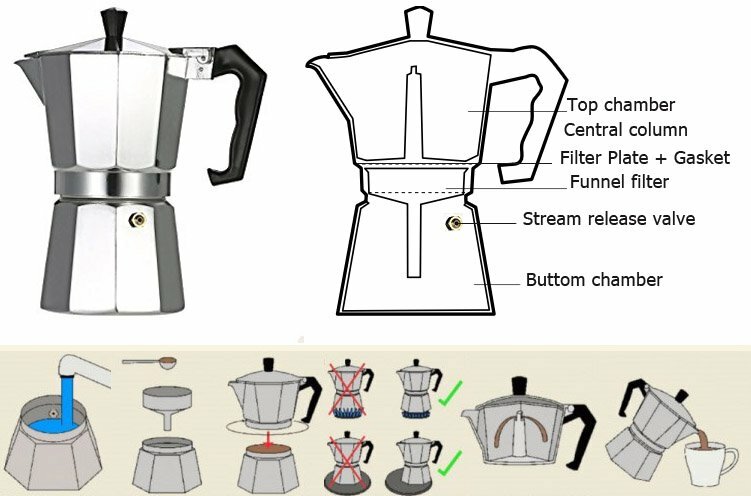 A Moka pot or Moka Express uses steam pressure to make coffee. This kind of appliance is popular in Europe, particularly in Italy, its homeland, where it is a national symbol. Moka pots vary in size and can make one to eighteen 50 ml cups of espresso. Original appliance are made of aluminum and have bakelite handles. Original Bialetti percolator made in Italy. 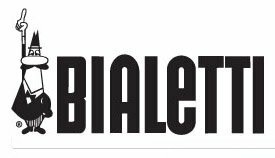 In 1933, Alfonso Bialetti, and Italian entrepreneur, got the first patent. Later that year his company Bialetti manufactured the very first Moka Express machine. The company used a slogan “in casa un espresso al bar”, which means “Espresso at home is as good as one in a bar”. The Moka Espresso was recognized as a national symbol and came fifth in the Twentieth Century’s Best Design nomination. Important: if you have just bought a Moka pot, it is better to pour your first two cups of coffee down the drain. Unscrew the upper part and remove the filter. Fill the bottom chamber with water up to the fill line. Do not let the water overflow the safety valve, or liquid will get through the joint during the brewing process and stain your stove. Fill the filter (a sieve) with a coffee mix to capacity, press it lightly. It is better to use medium ground beans. Put the pot back together, then place it on the stove or, if you have an electric Moka pot, plug it in. Do not leave it unsupervised. If you see water seep through some joint or hole, you must have failed to assemble it correctly. Once it boils, steam begins to rise. This is when it must be removed from the stove (most electric Moka pots switch off automatically). Do not open it when it is brewing! If you do, you may end up with poor quality drink or severe burns. Wait a few seconds until the boiling stops completely and serve it. Pour hot drink in warmed up cups. Thus your espresso will retain its natural taste and intense flavor. If there is sediment, you should use a coarser grind. If your drink feels too strong, add water or milk. Next time try different coffee grinds and find an optimal ‘body’ and mouthfeel. A percolator is good for those who have a bit of spare time and appreciate a genuine espresso taste. Stove-brewed espresso boasts a very full taste, and the seducing coffee flavor will fill your house instantly.